I'm trying to build a simple iOS application , with login feature to stack overflow network. I've read the documentation and choose to use Implicit OAuth2.0. I've already registered an StackApps, so I've a client_id and so on.. 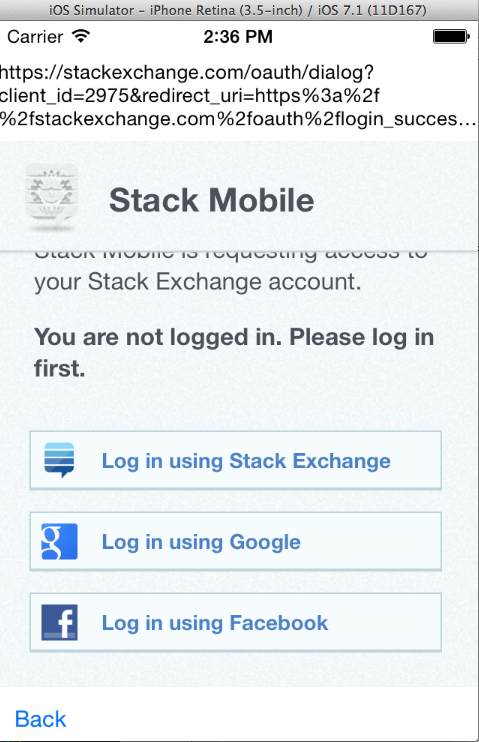 But i'm unable to login with stack account ! if parameters are correct, nothing happen ! i always remain on this page, even if login parameters were correct. I expect redirect or something ... What to do ? The problem was on iPhone emulator , i tested the same code on physical device iPhone and iPad with iOS7 , and worked as expected ! Not the answer you're looking for? Browse other questions tagged support api authentication oauth .